The Resident Evil 2 modding community is positively thriving and there has been a constant flow of new and exciting fan-made content that continues to keep players entertained well after its release. While Capcom has expressed interest in remastering other Resident Evil titles, it will likely be awhile before we get our hands on anything tangible since Resident Evil 2 Remake only just arrived. However, the wait needn’t be dull as there are tons of Resident Evil 2 mods that aim to shake up and change our experience. The sheer amount of freedom and experimentation mods offer is incredible, so I’ve searched the depths of the web to find the most ambitious and downright ridiculous Resident Evil 2 mods you can use and download right now. If you’re tired of looking at the hordes of decaying flesh eaters and want a more pleasant survival experience then look no further. This mod transforms Resident Evil 2’s shambling corpses into nutritious hordes of delicious tofu. Capcom originally included a playable tofu character in the classic Resident Evil 2 minigame "The Tofu Survivor", while Darkside Chronicles’ secret mode allowed players to face hordes of tofu as they fought their way through Raccoon Police Station's courtyard. This mod isn’t just a nod to one of Resident Evil’s most iconic Easter eggs, it also demonstrates just how terrifying everyday food items can be when they’re pasted into Capcom’s RE Engine. Resident Evil 7 was the first main series game to feature a first-person perspective. Creeping round the Baker family’s dilapidated home was a truly terrifying experience, and one that only comes with a more intimate approach to exploration. For the first time, players could get closer to the onscreen horror than ever before. Whether you were gingerly peeking around a doorway, blocking incoming attacks, or feverishly aiming your pistol, this new perspective delivered some viscerally terrifying moments. Resident Evil 2’s first-person camera mod aims to capture this feeling and offers a fresh perspective to both combat and exploration, so if you’ve beaten Resident Evil 2 and wish to shake things up, then this mod will do just that. Fans of Capcom’s prehistoric PlayStation classic have wanted a Dino Crisis reboot for years, so it’s not surprising that players have been busy creating dino-themed mods that can be used in Resident Evil 2. Modder Crazy Potato has reskinned Claire to look like Regina, changing her hair colour, hairstyle and outfit, while Leon has also received a makeover in order to look like Dylan Morton. Even Sherry gets to join in on the fun and has the option to wear a Dino Crisis themed jacket. Capcom may have let the Dino Crisis franchise die in 2003, but this mod proves that fans aren’t willing to let this prehistoric series slip into extinction. Capcom has done a fantastic job of recreating Leon and Claire’s classic zombie romp for a new audience, but older Resident Evil fans may appreciate this mod. If you want to give your copy of Resident Evil 2 a more retro look then this classic UI will do just that. Installing this mod will add the classic Leon and Claire sprites to the save screen, while your inventory is given a blue background that emulates the PlayStation original. This mod may not be the most visually impressive on the list, but it’s a nice touch for those that wish to give their game a retro feel without impacting gameplay. Mr. X has become an internet celebrity ever since fans first saw him stomping his way through the narrow hallways of Raccoon City’s Police Department. As a result, Resident Evil 2’s titular terror has been featured in numerous videos and meme compilations, so it was only a matter of time before someone gave Mr. X the theme tune he truly deserves. Of course, that song is DMX’s "X Gon' Give It To Ya". The modder DJPop has painstakingly replaced Mr. X’s "Black Impact" theme with DMX’s lyrical masterpiece. To use this mod, simply extract the file into your game’s directory and boot it up to enjoy this meme to its full potential. Capcom has expressed its interest in remaking Resident Evil 3 after fans praised the team’s work on the Resident Evil 2 Remake – in fact, players have been so hungry for more zombie slaying action that mod forum user ZERO has created a mod that replaces Mr. X with Nemesis. This beastly tyrant looks even more menacing than Mr. X, especially when this mod is combined with the original music and sound cues from Resident Evil 3. The next remake may be a few years down the development pipeline, but you can get your Nemesis fix with this reskin mod. 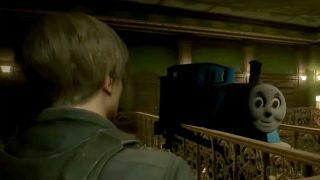 If Mr. X wasn’t scary enough you can now replace him with everyone’s favourite sentient train. Yes, this mod transforms Mr. X into Thomas the Tank Engine. The Skyrim modding community may have beaten ZombieAli by a few years, but the really useful engine has never looked so happy to be part of the nightmarish action. We highly suggest that you use this mod alongside DJPop’s soundtrack replacement so that you can hear the iconic Thomas theme song and accompanying sound effects. If you like the idea of running through the dark hallways as Thomas’ grinning face barrels towards you, then be sure to take this mod for a spin. Modder Enveloping Sounds has released a couple of videos showcasing what the Resident Evil 2 remake could look like with fixed camera angles. This mod is a true masterclass in camera placement and shows just how hauntingly beautiful Resident Evil 2 truly is. The orphanage is one of the spookiest places in the entire game, but this mod makes it look even creepier thanks to the various camera angles that help give a whole new perspective. Unfortunately, the ambitious nature of this mod means you can't play it, but it’s definitely worth checking out Enveloping Sounds’ YouTube channel if you wish to see more updates. This mod adds a variety of filters to make it look like you’re playing Resident Evil 2 on an old VHS tape. While it doesn’t change the general gameplay, it does make for a rather unique playthrough. Resident Evil is known for its cheesy lines and dumbfounding moments, so it only makes sense that someone would give it an old B movie vibe. If you wish to play around with the game’s visual settings and want to take some artsy screenshots, then this VHS mod will give you the tools you need. No respectable Resident Evil 2 mod list would be complete without featuring Mr. X at his best. This game-changing mod strips away Mr. X’s menacing apparel and replaces them with a pair of flip-flops, sunglasses, and an Umbrella branded thong. When the terrifying tyrant isn’t busy chasing Leon and Claire around Raccoon City Police Department, he’s hard at work honing his body at the gym. Mr. X may be an evil tyrant, but even he understands how important it is to put in the work when trying to sculpt that beach body look - after all, the Resident Evil franchise is filled with beautiful people, so why not make Mr. X one of them with this mod?